Increase involvement in the "consensus building processes" that are the basis of grass-roots Internet governance model, by making the "barrier to entry" even lower. 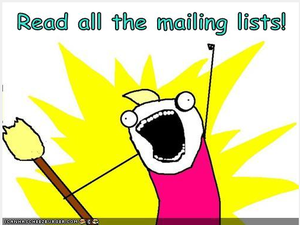 Mailing lists are a (social media) tool for participatory decision making processes, enabling archived discussions with the goal of reaching a concensus. They are used for a very long time in this way in many different setups, from technical standardisation bodies (IETF, W3C), Internet governace (Regional Internet Registries, ICANN), technical communities (NOGs, e.g. NANOG, UKNOF, DENOG...), to community projects such as hackerspaces. "Don’t forget neoliberals, neocolonial imperialists, or stalinists." Enabling "tagging" of mailing-lists posts would introduce an improvement in the direction of more modern "social media", such as web-forums (slashdot, reddit) or other platforms where users can "rate" the content (Amazon, FB discussion groups). "Tagging" is useful feature for several large communities that have many mailing lists (RIPE, NANOG, IETF); but also fo any smaller community (for example, hackerspace) that communicates via mailing lists. Using the karma server would lower the barrier for participation (since it is easier to rate "=1" or "-1" then to emial "mee too", or even more constructive post..). write a "button" for one client that "adds a tags, and forwards to another special-purpose list"
Per message annotations (2008 experimental standard), very useful. Per mailbox metadata (2009 standard), NOT useful. * IMAP already has a way of handling tags? prioritisation? We're currently planning a sprint to merge different repositories, analysis for a 0.2 release. https://github.com/datactive/bigbang/milestone/6 For this we're thinking of organizing a hackathon / code sprint, for which we're still looking for partners (and a bit of support to fly on of the main developers from the US to Amsterdam). This page was last edited on 6 December 2016, at 17:51.